Fitness and Nutrition Conference "Taking charge ofYour Temple"
Come join us, Saturday, March 26, 2011 10 a.m. - 3p.m. at First Baptist Church of Glenarden for The Health and Fitness Ministries!! We want to help you to live a lifestyle that focuses on the physical, spiritual and mental aspects of health. All three of these components play a major role on how each of us achieve personal goals in our lives that lead to our ultimate destiny that God has for us. Instead of just focusing on the physical body, this site takes a different approach to fitness by concentrating on the spirit and soul through the word of God that will assist in our thinking about nutrition, health and exercise. Inspire you through the bible and other inspirational materials that are in line with God's word. Provide you a whole new way of thinking about fitness, health and life. "Every man is the builder of a temple, called his body, to the God he worships, after a style purely his own, nor can he get off by hammering marble instead. We are all sculptors and painters, and our material is our own flesh and blood and bones." Our philosophy is that you have only one body and it is a gift from God that we want to help you take care of it. 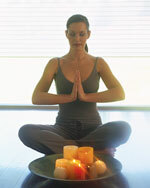 Let us help you build a healthier temple that includes your body, mind and spirit.